Part of the appeal that blogging holds for me is the community of people who cook and write about it for no reason other than the fact that they love it. Because the reality of the situation is that the chances of being the next [fill in your favorite superstar food blogger here] are pretty slim. Blogging is definitely not a get rich quick scheme. To the contrary, it’s a lot of work if you’re going to take it seriously. There’s the cooking and eating. Ok, so sometimes that’s a perk. Sometimes, not so much – I’m thinking of you Apricot Slump. Then you’ve got to take a picture that makes the world want to grab a plate and chow down, or at least click on the rest of the entry and read more. And if your picture is less than perfect, you may (as in all the time if you’re me) find yourself tweaking things in Photoshop, Picnik, or whatever software you’ve pledged your allegiance to. My friends, that’s the easy part of it. The hard part is making it come to life with words. The hard part is finding a fresh story time after time to bring people back, draw them in, and to make them want more. And the thing about bloggers is, they get it. They know how challenging it can be to juggle all of the things we “have to” do and find time for the things we “want to” do. They know that these blogs posts don’t just magically appear; there is someone behind the curtain that makes it all happen. So we encourage one another. We meet up socially in the real world. We comment on our blogs. We email one another. We offer an empathetic ear. Because we know the hell of experiencing a complete and utter FAIL and still having to write about it. We know how frustrating it can be to build a group of readers. We know that we’re not here for the recognition but it’s nice when someone shines a light on us. And when all else fails, like when you somehow hit ‘delete’ instead of ‘publish’ on your latest post, you can at least find comfort in knowing that you’re not alone. We’ve all done it. 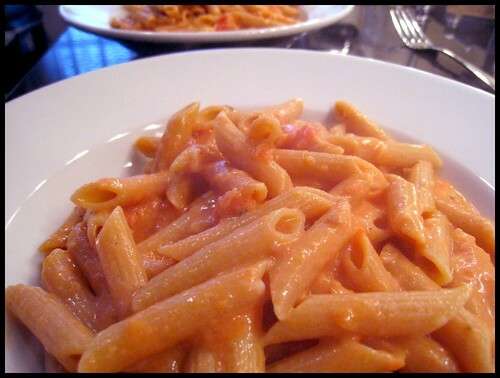 But if that’s cold comfort to you, I suggest you try a steaming plate of Penne With Vodka Sauce. It won’t resurrect that deleted blog post, but at least it will make your belly happy. BAH Note: This ‘adaptation’ resulted from the fact that I didn’t consult the recipe before buying the main ingredients – pasta and canned tomatoes. So I decided to make do with what I had. My sauce may be a little more creamy and less tomato-y than Christine’s, but it is still a Superstar in my book. She also used something like 8 cloves of garlic but mine is a decidedly garlic free zone. Working in batches in a food processor, or using an immersion blender, break up your tomatoes until they are chunky. Transfer tomatoes and juice to a large saucepan and bring to a boil over medium heat. Season with salt and pepper to taste and crushed red pepper flakes (if using). Stir, add the vodka, and reduce to a simmer. Meanwhile, bring a large pot of well salted water to a boil. Add the pasta and cook until al dente. Drain the pasta and return it to the now empty pot. Stir the cream into the tomato sauce. Add the sauce to the pasta and stir to combine. Add the grated cheese, stir to combine, and serve hot. You are not alone sista!! It really is a comforting thought isn’t it? But, then again, so is a plate of this yummy looking pasta! Kristin, this is the pasta I want when I have an utter fail day with the blog or life in general. I wonder if there’s a Food Blogger Support Group yet on Facebook? Hey, adding vodka to anything has got to improve the flavor, for sure!! One for the sauce, two for me…isn’t that how everyone cooks? Tracy, I bet you would rock this out and I’d love to see your spin on things. Bacon? Hells yes! Boo, you must be infinitely more patient than I am. Deletes, do overs, and fails really get under my skin. How can I encourage you to get busy in the kitchen? This penne would be a great, easy, place to build some kitchen confidence. I swear. Miss Wendi-pants, I’m actually making a big crock of jambalaya tomorrow. Prep tonight. Toss in the crock in the morning. Consume come 6pm. Very smart Boo. Miss Wendi-pants, can I start calling myself that? Wendi!!!!!! You made my sauce and my day!!! However… I can’t imagine a SINGLE meal without my loving garlic cloves. But to each their own 🙂 So glad you enjoyed this recipe! Christine, this is a 100% rock star recipe. Glad to shine the spotlight on you and this gem of yours. Oh Wendi, I wish we had some of this to eat tonight. I’m having a hard time readjusting to life off the boat–I mean, I have to cook my own food? Beth, you’re back! I saw a cruise ship pulling into port yesterday and wondered if you guys were home. This would be a great recipe to ease you back into cooking. Welcome home hon.